Cover an old white pages phone book (or two) with vinyl contact shelf liner paper. No phone book? How about a small cardboard box stuffed with pillows, or books? 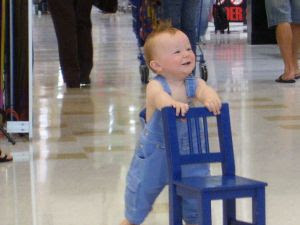 Place on a regular kitchen chair to create an instant booster seat for your toddler. Add an adult's belt or luggage strap around the child and the back of the chair for security. Never leave your child alone in this (or any other) booster seat. Some kids are escape artists or can wiggle down and get themselves tangled up, so children should always be supervised.